Are you a canned goods manufacturer or distributor? Do you need help meeting those target sales? Increase earnings using premium canning labels. They are responsible for differentiating your products from competitors and serve as your salespeople in supermarkets and grocery stores. A good label can increase brand awareness and sales. . They could be the difference between a successful business year and a failed one. We can also make labels to personalize your homemade jam, pickles, salsa, or any mouthwatering treats. 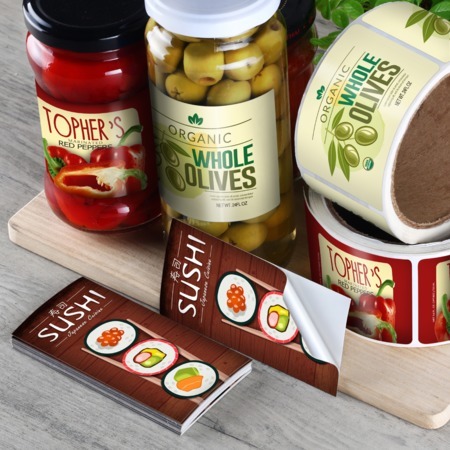 Our canning labels are made of a durable vinyl material design to withstand moisture. Our canning labels are available in roll or cut-to-size forms. Cut-to-Size Labels: These are individually-cut rectangular and square-shaped labels. They are printed in premium self-adhesive paper or waterproof vinyl. They are available in various sizes and ideal for most jar surfaces, shapes, and sizes. Roll Labels: Roll labels are easy to apply by hand or dispenser. We print them in different quality paper, plastic/film, or textured materials. They're available in various die-cut shapes and sizes. They have self-adhesive properties that make them easy to stick to most surfaces. After you upload your designs, or create them online, you can use our free proofs. These allow you to view your complete designs and check for any errors before the actual printing. Our low minimums are perfect for your small business, test production runs, and personal gifts. Try different versions of your label designs and find out what's best for you!